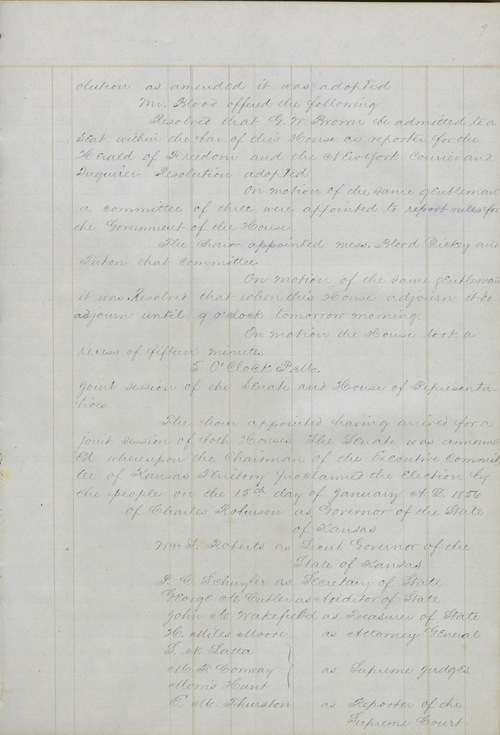 This Journal of the House of Representatives of the State of Kansas was, apparently, the original record of the Free State Provisional Government of Kansas, which was organized at the Big Springs Convention September 5, 1855. Joel K. Goodin was chief clerk of the House and felt the journal was "a flat contradiction of the pro-slavery inuendo, that we were all abolitionists from Boston, Massachusetts, and hired to come to Kansas by the Emigrant Aid Society." The journal was published in its entirety in the Kansas Historical Collections 13:166-249.